The Galleta Meadows Sculpture Installations in Borrego Springs (along Borrego Springs Rd.) are TV’s “Land of the Lost” come to life! Dozens of metallic dino-type creatures and other wild animals roam freely through the desert landscape. Artist Ricardo Breceda’s newest, largest and most wondrous creation: A 350-foot long Chinese dragon! Two more roadside pop art wonders that are definitely worth the drive: Rancheti Big Foot sculpture in Ranchita (on the way to Borrego Springs) and the World’s Largest Lemonsculpture in Lemon Grove. 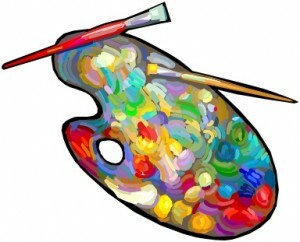 Kaleidoscope of color at Hubbell House & Studios! Tucked away in the Julian hillsides is San Diego’s own Barcelona of the backcountry: James Hubbell House and Studios, a 40-acre arts complex showcasing the fantastical designs of artist/sculptor/architect extraordinaire James Hubbell, considered “San Diego’s Gaudi.” Group tours are available by appointment. Speaking of Julian, their popular annual apple harvest is just around the corner (mid-Sept. through mid-Nov.). Head to Raven Hill Orchard to not only pick apples from an orchard of 8,000 trees with seven varieties of apples(! 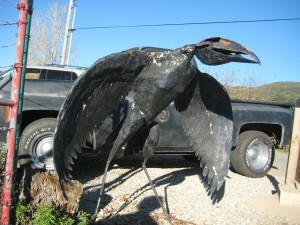 ), but also stroll through a marvelous outdoor gallery of sculptures by accomplished artist Patrick Brady. 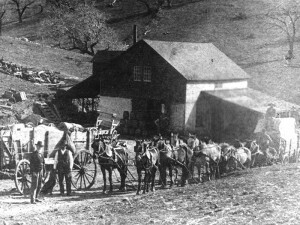 East County’s Wild West culture of cowboys, pioneers and prospectors who set their sights on this vast inviting frontier comes alive at the Julian Pioneer Museum, features gold mining equipment, Native-American artifacts, animal and bird mountings, an original “Julian City” buggy and sleigh, Victorian clothing and one of the finest collections of lace in California. "His Wealth" painting by Olaf Wieghorst. 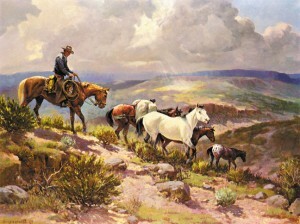 Giddyup to the Olaf Wieghorst Museum and Western Heritage Centerin downtown El Cajon to view dozens of paintings by nationally renowned artist Olaf Wieghorst, portraying the 19th century American West, including cowboys, Native Americans and pioneer settlers. 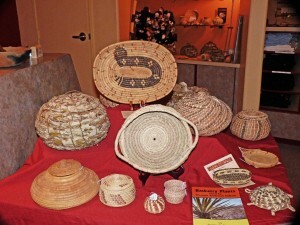 Reed baskets and art at the Barona Museum. For the Native American perspective, the Barona Cultural Center & Museumis a must-see; San Diego’s only museum on an Indian reservation dedicated to the perpetuation and presentation of local Native-American culture, including handmade pottery, reed baskets, paintings, arrowheads and other artifacts dating as far back as 10,000 years! El Cajon offers enticing palette of galleries. Modern art aficionados will want to check out El Cajon’s burgeoning Art Gallery Walk on Main Street downtown (between 120 and 140 E. Main), including the fabulous new Studio C Contemporary, Silver Creek Fine Art, Main Street 5 Gallery, The Rich Artist Studio, White Sage Gallery and Merkabah Gallery. From quaint and quirky to weird and wonderful, San Diego has numerous backcountry marvels that dot the expansive East County region. Roadside attractions have always fascinated me because they meld America’s love affair with the road with a creative entrepreneurial spirit that makes drivers do a double take. Following are five fun ones to try. Get your motor running! 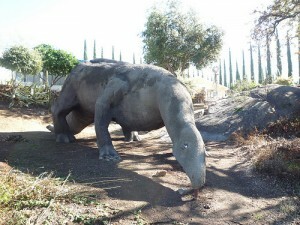 A sweet tart of roadside attractions in Lemon Grove. “Rancheti” Bigfoot statue in Ranchita (along County Highway S22, 9 mi. 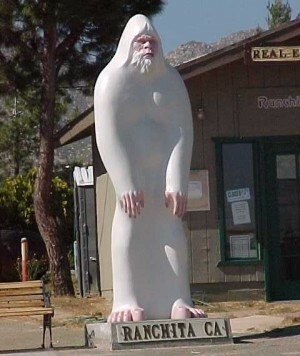 SW of Borrego Springs): This 11 foot, 300-pound white yeti statue – built by Ranchita resident/realtor Joe Rauh to bring attention to his tiny desert town – keeps watch over the parking lot by the Ranchita Country Store. A must-see for “snowbirds” and other desert visitors; stop by, take photos and pick up a souvenir T-shirt or tote bag. Desert View Tower in Jacumba (located on Historic Highway 80): This 70-foot, San Diego historic landmark – commissioned in 1922 as a tribute to early pioneers – is renowned for its incredible panoramic views of the desert floor below (views stretching from the Salton Sea to Mexico!) and a wonderfully weird Americana museum and boulder garden filled with whimsical painted animal rock carvings. Admission: $3. Ensuing laughter from this offbeat roadside attraction: priceless. 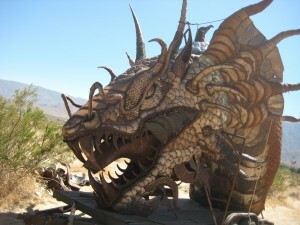 I’ve mentioned them before, but the “Sky Art” Sculptures in Borrego Springs (Galleta Meadows Estate along Borrego Springs Road) – a magical metallic menagerie of dozens of freestanding life-size sculptures of creatures that roamed the valley millions of years ago – are well worth repeating. All that's left of Dinosaur Land in Alpine is this friendly fellow.